The incorporation of phosphorus atoms into cyclic conjugated structures provides heterocycles with unique properties. Although the first phosphorus heterocycles date from the late 1950’s, their application in materials science is relatively recent. Extensive research efforts are being currently invested in the discovery of novel phosphorus architectures that could open up new horizons in materials science. 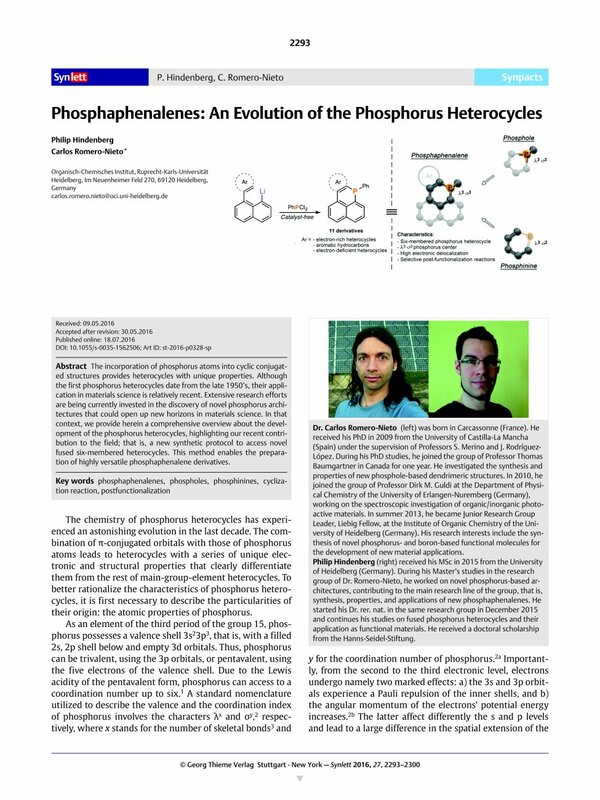 In that context, we provide herein a comprehensive overview about the development of the phosphorus heterocycles, highlighting our recent contribution to the field; that is, a new synthetic protocol to access novel fused six-membered heterocycles. This method enables the preparation of highly versatile phosphaphenalene derivatives. 3 Compendium of Chemical Terminology (IUPAC). McNaught AD, Wilkinson A. Blackwell; Scientific Publications; Oxford: 1997. 2nd ed. 6 Romero-Nieto, C. unpublished results. 31 Romero-Nieto, C. unpublished results.